Meanwhile, EU is quite happy eroding all my gains in GU, GREAT! Is that it for the Pound or is it going to spring back to life? 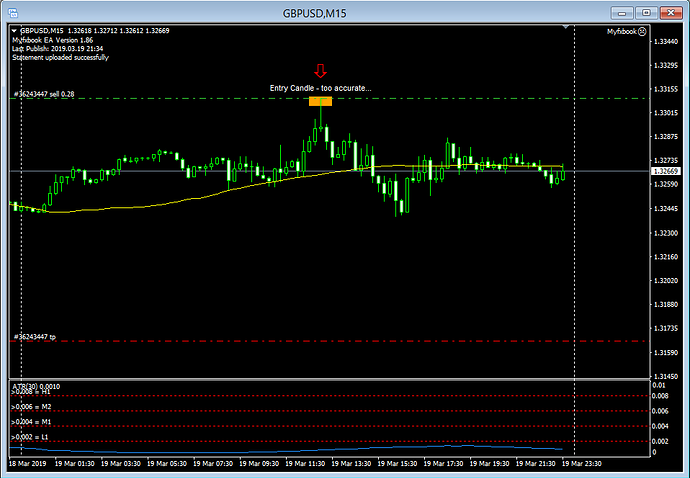 This huge 170+ pip move started a week ago… USDCHF (1 Hour) how could you miss it? He is not deleting them. I am. Please stop posting unless it relates to the topic and doesn’t violate our Forums Policy. Is it just me, or ? I’ll update this after taking Dennis’s ranking and combining it with a unique currency rank and not using the strength formula from above. Just one trade using Dennis’s top v bottom currency. Updated from earlier. If you’re a retail trader the best advice I can give is - DO THE OPPOSITE OF WHAT EVERYONE ELSE IS DOING. 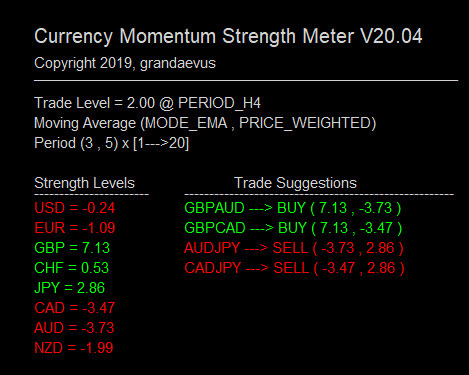 Who would of thought that you can use the RSI as a leading indicator and use it the opposite of what everyone else uses it for… Use it for CURRENCY STRENGTH and NOT for overbought/oversold. I never ever say it can’t be done, I just try to keep the noobs straight on what this thread is about, which is LONG term view, and as we know, everyone is looking just for day trade signals. 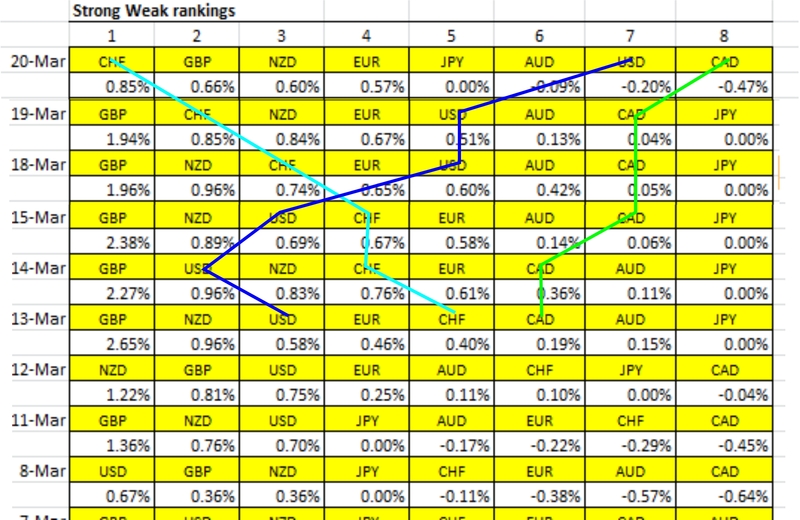 I know what make a currency index, look, I have a pretty graphic also. I have seen that use of RSI setting on 2 before, that’s on daily I assume, problem is, when and how do you decide there is signal to enter short, for example on the EURJPY? Do you drop to 4 hour or 1 hour for some type of confirmation or just keep checking the RSI value daily? EUR was weak, JPY was strong so double movement there. 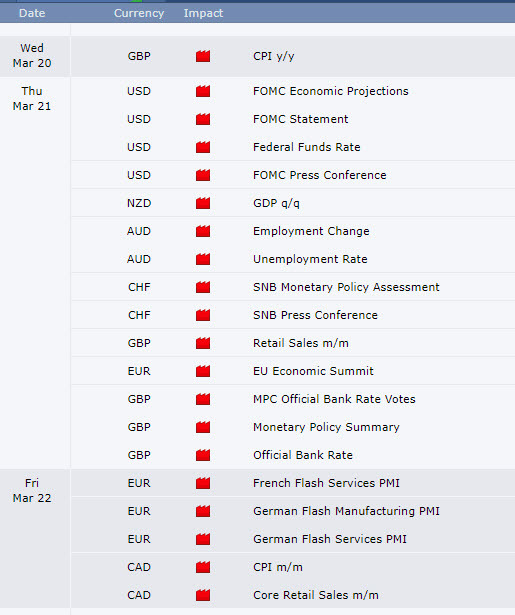 it’s all well and good but obviously if the EUR has been weak and dropped against say the JPY. Then ALL currency strength meters, indicators WILL say that the EURJPY is going down… AFTER SAID MOVE. Its just another retail trap… Take your image as posted above. So according to that we sell the EURJPY… NO, as in all probability the down move has already moved… Will it keep going down. Will it have a nice big pullback… Those indicators won’t tell you that. I could go on but I don’t want to be off topic on Denis’s thread. 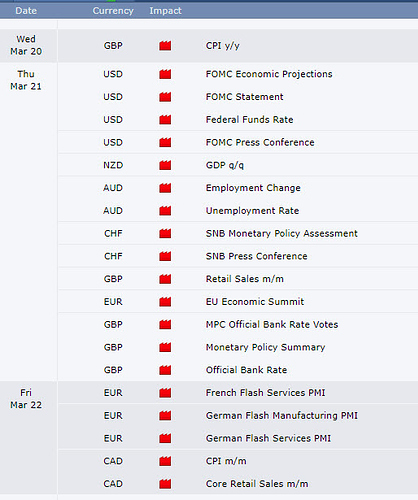 I also use finviz for analysis, the EUR down move started after their economic data release. It started moving down gradually from about +0.12% down to about -0.80% All of these time where several short opportunities for few pips though, say 20 - 50 pips. The image shown by Snowman is just to show the relative movement of the pairs during that day. Not telling you to go short right now. Personally, if I see a short move that has reach -0.80% I begin scaling in buys instead of going short. Experience teaches us that. Daily CSW is a strategy of its own and it is very short term. Dennis’ CSW is more of a long term approach. They are two functional but different approach analysis. You both share a common aim - generating profit from the available information. You & snowman are both on the money, as is Trendswithbenefits when he throws his meat on the fire. Quite often several different routes lead to the same destination. All 3 of you contribute impressive posts. I’m sure between you it should be more than possible to blend this material into a workable format for the benefit of all concerned?..especially for those newer members who are particularly attracted to this type & style of accompanying price analysis. Yes the Snowman posted the most powerful images… I will try and explain. Note : The chart below is a chart made up of EURUSD AND USDJPY added together. So if the momentum (Setting 1 on daily) on the EURUSD*USDJPY (* = times by) we buy the EURJPY if its above the momentum zero line and sell EURJPY IF below the momentum zero line on the EURUSD*USDJPY. So we can buy and sell the EURJPY without even looking at the EURJPY chart. 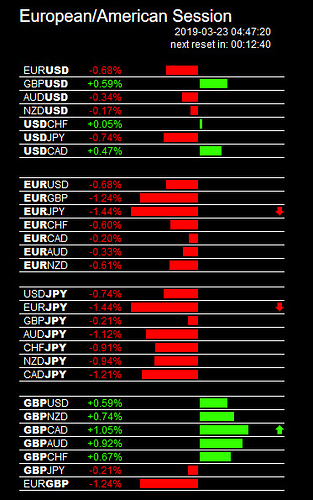 SO if the EURUSD is going down and the USDJPY is going down we know the EUR is weak and the JPY is strong. Its going off topic again and don’t want a warning from the mods or Dennis and I think his approach has lots of merit… We just have to use other methods of when to buy/sell the weakest/strongest in his ratings. If I made any mistakes. I apologize as I’m so tired… Long nap needed. Yeah you’re right, i totally agree. Nothing to stop you guys kicking off a fresh thread though & running the concept of this style of analysis elsewhere. After all, it perfectly dovetails with & complements the material Dennis painstakingly submits on regular basis. I’m sure he wouldn’t object to you guys utilising his grids from time to time to emphasize overlapping scenarios. It would offer all 3 of you the opportunity to run a parallel theme which i’m sure will attract a healthy audience & benefit the forum population. There’s a good degree of generic interest & you guys contribute some very interesting & intelligent observations on the subject matter. Surely it’s a win-win for the audience? Don’t know about you guys, but i can’t really see any downside to adding more quality content for folks to digest & process along the lines of Dennis’ material? Yes, great explanation and thanks for the backup. But the procedure is to take note, as you said, what is happening during the trading day. 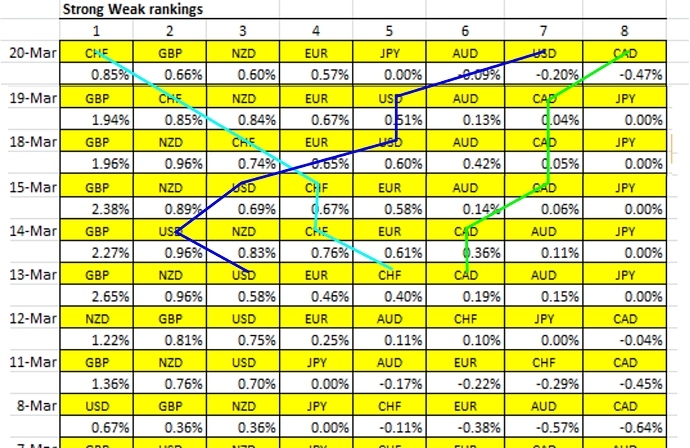 Also, I watch various CSM for any other clues as to what is moving, other JPY pairs had good trades too.